Using breakpoints is central part of debugging. I’m usually debugging my applications in flash memory. Because nearly all the microcontrollers I use have on-chip flash memory, and have more flash than RAM. With debugging in flash I limited by the number of hardware breakpoints. And here is the advantage with debugging code in RAM: availability of ‘unlimited’ software breakpoints. But how does this all works, and how to make efficient usage of hardware breakpoints? If the processor runs the code at address 0x102, it will trigger the debug module as defined in the microcontroller architecture. I can take advantage of this as well in my application code. For example the ARM Cortex architecture supports the BKPT instruction. I can use this to have present in an interrupt routine to stop my target: The processor will cause an ‘illegal instruction’ exception which the debugger can catch. If the debugger fails to restore the original instruction, then the software breakpoints remains and causes a target halt when it reaches that instruction. The debugger might report “illegal breakpoint” or something similar depending on the debugger. The problem might be caused by a board or hardware problem. Then the debugger breakpoint list might be corrupted too, and in this case it is best to reload the application to the target. The good thing with software breakpoint is that it provides a almost unlimited number of breakpoints. And because changing instructions in RAM is easy for the debugger, software breakpoints are used for applications in RAM. Some debuggers even apply software breakpoints on code running in flash memory. But this usually will make setting and removing breakpoints a time-consuming thing: The debugger has to erase and re-program the flash to set and remove the breakpoints. Other architectures implement a ‘patch list’, similar what is shown above with the debugger breakpoint list: with this it is possible to set software breakpoints with hardware. Which leads us to ‘real’ hardware breakpoints. To make debugging in flash memory easier, silicon vendors have added hardware breakpoint capabilities to their cores. Typical hardware breakpoints watch an internal bus or the program counter, and if it matches a certain condition, it will stop the processor, or will do whatever the hardware implements for that condition. With this hardware capability, the debugger needs to know that particular device Hardware Debug Trigger module to set the flags. However, the number of hardware debug triggers is limited. The ARM Cortex-M0+ which is on my Freedom board is no exception to this: ARM has implement hardware debug support in the CoreSight module. The ARM Cortex-M0+ CoreSight can have 1, 2, 3 or 4 hardware breakpoints implemented. So I have software and hardware breakpoints, but do I have any control over what is used by the debugger? This especially useful if I’m running an application with parts in RAM and parts in FLASH, or if I want to use hardware breakpoints for code in RAM. Obviously the debugger is using Hardware breakpoints, according to the ‘Type’ column, and only two are set successfully. Having too many breakpoints set will have some impact on debugging. Note: I pay close attention to the Breakpoints View and if my breakpoints have the check mark set or not. Because debugging a problem with a breakpoint not set I was thinking only I had set it is not very productive. And it allows me to closely monitor how many hardware breakpoints are used. Breakpoint Warning: Unable to set all breakpoints requested. Target request failed: Failed to step. It means that the debugger was not able to set a breakpoint. What happened? If I do a ‘step out’, the debugger needs an extra hardware breakpoint to stop the target if I step outside of the current function. But it if all my hardware breakpoints are already used, then the debugger cannot set that extra one. A solution to this situation is to disable my hardware breakpoints in the Breakpoints view while stepping. But there is a small trick which can make my life easier :-). 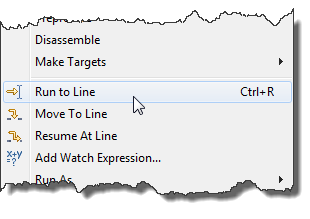 Skip Breakpoints during ‘Run to Line’ operation. An even easier view is to place the cursor in the Source view, and using the Ctrl+R shortcut. 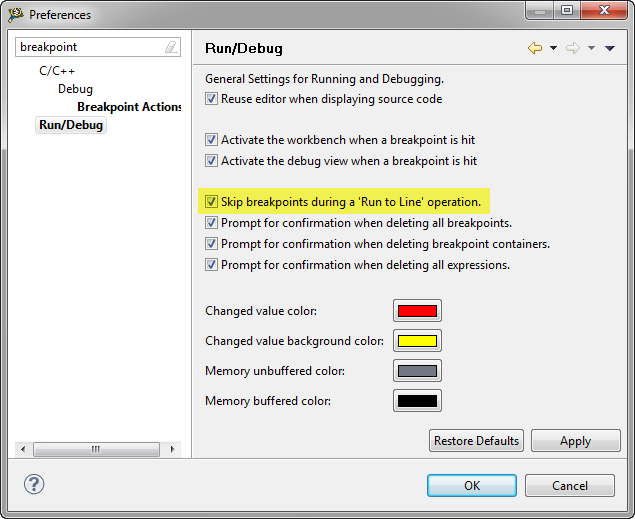 With this I do not need to disable my hardware breakpoints in the Breakpoints view, and still can do full debugger stepping. And as a side effect, I’m not running into my otherwise set breakpoints. Hi Erich, I have a problem when debugging a bareboard project at KL46Z. 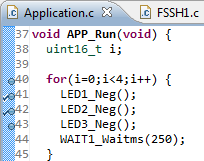 ¿Do you know why I need to press several times Step Over F6 to advance a debug line? Thanks! No, I don’t have that. Is it only with the F6 key or as well with pressing the button? What debug connection are you using? I tried again and works well, the number that was changing when pressing F6 is the one highlighted in the image. Thanks for the reply and congratulations for the site. Hello there, I’m having an issue related to RESET on MKL25 processor. Some times when I press reset button on my board the firmware stops on thumb_startup() and keeps waiting for a RUN command (F8 on CodeWarrior 10.5), even if the Segger is disconnected. How do I make the RESET button actually resets the processor and make it run after it? In a real applicattion the Segger hardware certainly will not be there… 😉 Could it be related to breakpoints? the thing is that the debugger through the K20/OpenSDA on your board detects the reset, and halts the target. It won’t halt it if you do not have a debug session running. So if you are not debugging (e.g. the FRDM-KL25Z board), then the K20/OpenSDA is not active, and the KL25Z will run out of reset. Same thing with your custom hardware. 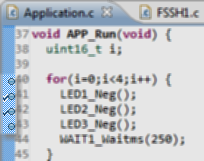 and the opcode for the Cortex-M BKPT instruction is actually 0xbe. Might be worth clarifying just in case somebody assumes that the machine code encoding of a Cortex-M breakpoint instruction is 0xffffffff? yes, that example is assuming a hypothetical CPU architecture. I have the text updated to reflect that. did you try to setup breakpoints dynamically from within the target itself? my intention is to trigger breakpoints dynamically on the target.